Many months ago I heard that my uncle had some antlers from his latest hunting adventure that he wasn't planning to keep. I asked him to send them to me, not having any real plan in mind. His daughter, my cousin Lauren is getting married in November. I knew I wanted to incorporate the antlers into a gift for her. While sitting in a hammock on Perhentian Besar in Malaysia (on my honeymoon), I pulled out my sketchbook and let my imagination wander. I was intrigued by the idea of creating something delicate and feminine from a bone grown purely for masculine posturing. When I returned, I set to work. I used whatever tools were already on the bench, which meant a less-than-ideal process - but that's how learning happens. I did learn that drilling antler smells unpleasant when done improperly. After completing the three smaller designs, I sawed a larger segment and allowed the form dictate the flower. A calla lily for the mother of the bride. The antler wasn't pure white, so I soaked the finished flowers in hydrogen peroxide for a few hours to brighten them up. 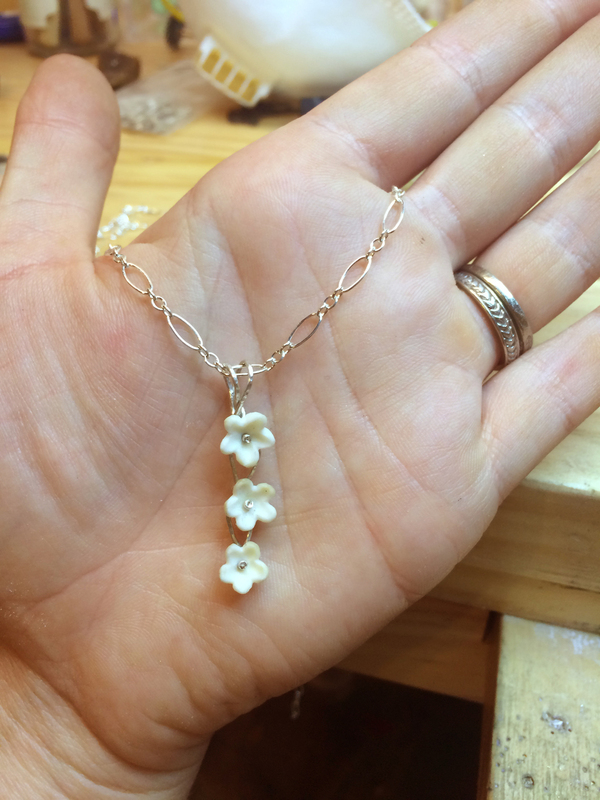 Sterling silver chain and findings complete the pieces. I always prefer to texture wire because I like the way light reflects off forged edges.